Whether you have just purchased the mbed Starter Kit or you are just checking out this page to see what mbed is all about, you are in for a treat. The mbed platform is a project created by ARM to assist with rapid prototyping on microcontrollers. Yes. Rapid prototyping. 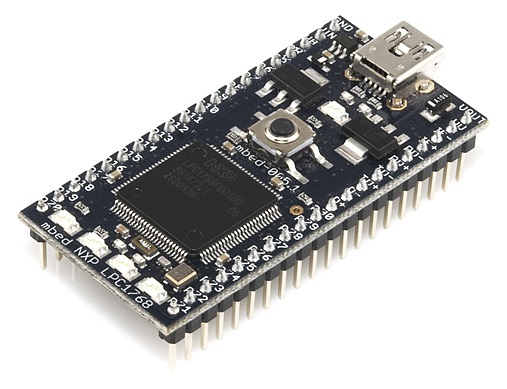 ARM has created a system for programming their microcontrollers with ease. This means no more fiddling with expensive and bloated development environments or fussing with confusing programming steps. mbed.org offers an online compiler that handles most of the setup and compiling steps for you. Don't worry about the specific steps, we will cover them in detail in the first tutorial. By following the next few tutorials, you will become an mbed kung fu master*! *Disclaimer: Kung fu not an actual part of mbed development. The mbed project actually contains a large variety of mbed platforms. For this kit and the following tutorials, we will be concerned with the LPC1768. If you have purchased the mbed Starter Kit or the LPC1768, open up the LPC1768 box, and you will find a pinout card. 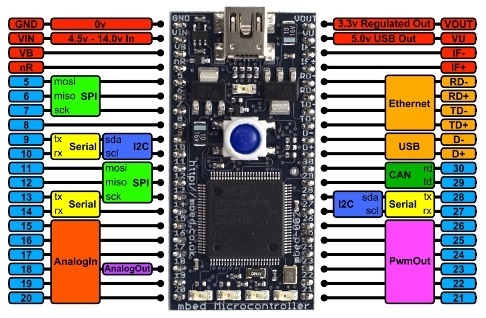 This card is extremely useful for finding out which pins do what on the LPC1768.